Just before I left the office last night, a rush of emotion came over me when I realized that today would be New Year’s Eve and 2014 would soon be a distant memory. Envisioning myself at midnight tonight, I became determined to have a bottle of Dom Perignon to celebrate the successful conclusion of my dry year. Surely, if ever there would be a time to enjoy a bottle of what is widely considered one of the world’s best champagnes, the anniversary of a full year without alcohol would be it. 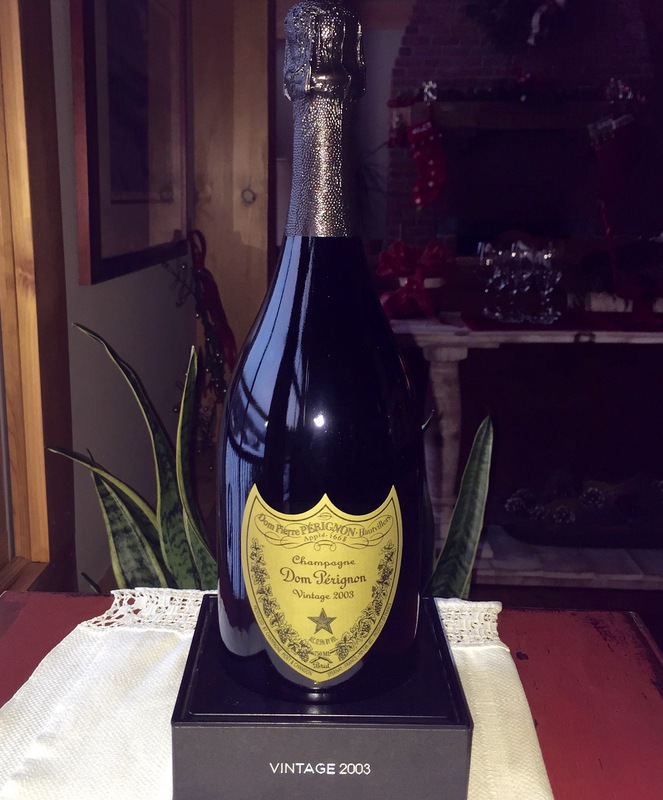 So, I did a bit of online searching, made several phone calls, and managed to track down the only bottle of Dom Perignon within a 20-mile radius. Luckily, I was able to reserve it and pick it up along my commute home. It turns out that the bottle is from 2003 and is in a gorgeous commemorative box, bringing, perhaps, a bit more value to the $175 price tag that I paid for the bottle. Yes, I know that it’s sort of crazy to spend that much money on one bottle of consumable liquid. However, I deserve it, don’t I? It might be hard for someone to believe me when I say that having this special bottle to celebrate with tonight actually has nothing to do with wanting to drink alcohol again. Recently, I very happily celebrated Thanksgiving, Christmas Eve, Christmas, and my step-daughter’s engagement party and never once thought that these milestone family gatherings would have been enhanced one iota by my drinking alcohol along with everyone else. The best way to describe my desire to make tonight a once-in-a-lifetime celebration is to say that I am proud of myself. I can’t believe I did it. I launched my resolution and my blog exactly one year ago today, and went from enjoying a few glasses of wine every night and being a fixture at local wine-and-food-paired dinners to going an entire year without drinking alcohol. Along the way, I lost well over 20 pounds, cut 23 minutes off my best marathon time, and, more importantly, learned a lot about the power of alcohol in our society and about myself. As added bonuses, I took an unforgettable trip to Laos to celebrate my journey and started writing regularly about my parents’ nearly four decades in the Vermont inn-keeping business. Tonight, I’ll observe the end of a truly incredible 2014 and the promise of the New Year with family and friends over a bottle of something extra special. What happens after that is anyone’s guess. You can be sure, however, that I’ll let you know in future blog posts. Thanks for following – and, Happy 2015! ps…I sent the last email before telling you that you were part of my inspiration for almost 5 months alcohol-free and 35 lb drop in weight. Congratulations on such a wonderful achievement! I hope to see you again very soon. I’m awfully worried your tolerance will be so compromised that you could very easily overdo it. Just to be safe, I’d better have the brunt of that bottle. And, we need a designated driver for the first time in a year! Congratulations Sharon — I’ve enjoyed following your progress over the year. Congratulations! It will be interesting to know how you do in moderation. Thanks for sharing.